A warm summer day found me slowly walking up the shady groves of Ashley Hill, Bristol. At the top the immense buildings which shelter over two thousand orphans, built by a man who has given to the world the most striking object lesson in faith it has ever seen, met my gaze. The first house was on the right, and here, among his own people, in plain, unpretentious apartments, lives a saintly patriarch, George Muller. Passing through the lodge gate, I paused a moment to look at House No. 3, one of the five erected at a cost of $600,000. The bell is answered by an orphan, who conducts me up a lofty stone staircase, and into one of the private rooms of the venerable founder of this great institution. Mr. Muller has attained the remarkable age of ninety-one. As I stand in his presence, veneration fills my mind. "Thou shalt rise up before the hoary head, and honour the face of the old man" (Lev. 19:32). He received me with a cordial handshake and bade we welcome. It is something merely to see a man by whom God has accomplished a mighty work: it is more to hear the tones of his voice; far greater than either is the privilege of being brought into immediate contact with his spirit, and of feeling the warm breath of his soul breathed into one's own. The communion of that hour will be graven on my memory while life shall last. This servant of the Most High opened his heart to me, counseled me, prayed with me, and gave me his blessing. 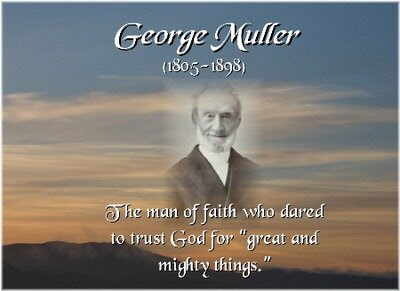 In that hour the source of George Muller's great spiritual strength was clearly made manifest. The aged saint with all his faculties unimpaired, was eloquent the whole time on one theme, the praise of Jehovah, the great Hearer and Answerer of His people's prayers. My own words were few. "You have always found the Lord faithful to His promise, Mr. Muller?" "Always! He has never failed me! For nearly seventy years every need in connection with this work has been supplied. The orphans, from the first until now have numbered nine thousand five hundred; but they have never wanted a meal. Hundreds of times we have commenced the day without a penny; but our Heavenly Father has sent supplies the moment they were actually required. There never was a time when we had no wholesome meal. During all these years I have been enabled to trust in the living God alone. Seven million five hundred thousand dollars have been sent to me in answer to prayer. We have needed as much as two hundred thousand dollars in one year, and it has all come when needed. No man can ever say I asked him for a penny. We have no committees, no collectors, no voting, and no endowment. All has come in answer to believing prayer. God has many ways of moving the hearts of men to help us, all over the world. While I am praying, He speaks to one and another on this continent and on that to send us help. Only the other evening, while I was preaching, a gentleman wrote a check for a large amount and handed it to me when the service was over." "I have read your life, Mr. Muller, and noted how greatly your faith has been tried at times. Is it so now?" "My faith is tried, as much as ever, and my difficulties are greater than ever. Besides our financial responsibilities, suitable helpers have to be found constantly, and suitable places provided for hundreds of orphans constantly leaving the homes. Then often our funds run very low; only the other week we had come nearly to the end of our supplies. I called my beloved helpers together, and said to them, 'Pray, brethren, pray!' Immediately five hundred dollars was sent us, then a thousand, and in a few days seven thousand five hundred came in. But we have always to be praying, always believing. Oh, it is good to trust in the living God, for He hath said, 'I will never leave thee, nor forsake thee' (Heb. 13:5). Expect great things from God, and great things you will have. There is no limit to what He is able to do. Praises for ever to His glorious name! Praise Him for everything! I have praised Him many times when He sent me ten cents, and I have praised Him when He has sent me sixty thousand dollars." "I suppose you have never contemplated a reserve fund?" "To do so would be an act of the greatest folly. How could I pray if I had reserves? God would say, 'Bring out those reserves, George Muller.' Oh no, I never thought of such a thing. Our reserve fund is in Heaven. The living God is our sufficiency. I have trusted Him for one dollar, I have trusted Him for thousands, and never trusted in vain. 'Blessed is the man that trusteth in Him'" (Ps. 34:8). "Of course you have never thought of saving for yourself?" Not easily nor soon shall I forget the dignified manner in which I was answered by this mighty man of faith. Hitherto he had been sitting opposite me with his knees close to mine, his hands clasped, his eyes betokening a calm, quiet, meditative spirit. Most of the time he had leaned forward, his gaze directed on the floor. But now he sat erect, and for several moments searched my face, with an earnestness that seemed to penetrate my very soul. There was a grandeur and majesty about those undimmed eyes, so accustomed to spiritual visions and to looking into the deep things of God. I do not know whether the question sounded to him as a sordid one, or whether it touched a lingering remnant of "the old self" to which he alludes in his discourses. In any event, there was not a shadow of doubt but that it roused his whole being. After a brief pause, during which his face was a sermon, and the depths of his clear eyes flashed fire, he unbuttoned his coat and drew from his pocket an old-fashioned purse, with rings in the middle separating the character of the coins. Placing it in my hands he said quietly, "All I am possessed of is in that purse—every penny! Save for myself? Never! When money is sent to me for my own use, I pass it on to God. As much as five thousand dollars has thus been sent at one time; but I do not regard such gifts as belonging to me; they belong to Him, whose I am and whom I serve. Save for myself? I dare not save; it would dishonor my loving, gracious, all-bountiful Father." I handed the purse back to Mr. Muller. He told me the sum it contained, and what he himself had given to the Orphanage and the Scripture Knowledge Institution. These matters, however, together with a few others, I am not at liberty to disclose. There was a glow of holy enthusiasm in the face of this aged, faithful man as he related some of the incidents pertaining to his preaching tours in forty-two different countries [Note: Mr. Muller began his travels when he was 70 and continued until he was 87 (from 1875 to 1892)] and how, in traveling from place to place, in some instances thousands of miles apart, his every need had been supplied. Hundreds of thousands of men and women of almost every nation had come to hear him, and his great themes were the simple message of salvation and the encouragement of believers to trust in the living God. He told me that he prayed more about his sermons than anything else and that often the text was not given him until he had ascended the pulpit stairs, although he had been praying for it all week. I asked him if he spent much time on his knees. "Hours every day. But I live in the spirit of prayer. I pray as I walk, when I lie down, and when I rise. And the answers are always coming. Tens of thousands of times my prayers have been answered. When once I am persuaded a thing is right, I go on praying for it until the end comes. I never give up!" These words were spoken in an exulting tone. There was a ring of triumph in them, and the man's countenance was aglow with holy joy. He had risen from his seat while uttering them and had walked around to the side of the table. "Thousands of souls have been saved, in answer to my prayers," he went on. "I shall meet tens of thousands of them in heaven." There was another pause. I made no remark, and he continued: "The great point is to never give up until the answer comes. I have been praying every day for fifty-two years for two men, sons of a friend of my youth. They are not converted yet, but they will be! How can it be otherwise? There is the unchanging promise of Jehovah, and on that I rest. The great fault of the children of God is that they do not continue in prayer; they do not go on praying; they do not persevere. If they desire anything for God's glory, they should pray until they get it. "Oh, how good, kind, gracious, and condescending is the One with whom we have to do! He has given me, unworthy as I am, immeasurably above all I have asked or thought! I am only a poor, frail, sinful man, but He has heard my prayers tens of thousands of times and used me as the means of bringing tens of thousands of souls into the way of truth, in this, and other lands. These unworthy lips have proclaimed salvation to great multitudes, and very many people have believed unto eternal life." "I only knew that God was in it, and was leading His child into untried and untrodden paths. The assurance of His presence was my stay." "I cannot help noticing the way you speak of yourself," I said, conscious that I was approaching a subject at once tender, sacred, and closely allied with his deepest spiritual moods and personal relationship to God, and I half-reproached myself as soon as the words were uttered. He disarmed my fears by exclaiming, "There is only one thing I deserve, and that is hell! I tell you, my brother, that is the only thing I deserve. By nature I am a lost man; but I am sinner saved by the grace of God. Though by nature a sinner, I do not live in sin; I hate sin; I hate it more and more, and love holiness more and more." "I suppose through all these long years in your work for God, you have met with much to discourage you," I asked. "I have met with many discouragements; but at all times my confidence has been in God," was the reply. "On the Word of Jehovah's promise my soul rested! Oh, it is good to trust in Him; His Word never returns void! 'He giveth power to the faint, and to them that have no might, He increaseth strength' (Isaiah 40:29). This applies also to my public ministrations. Sixty-two years ago I preached a poor, dry, barren sermon with no comfort to myself and, as I imagined, with no comfort to others. But a long time afterwards I heard of nineteen distinct cases of blessing resulting from that sermon." I told him a few of the things that had discouraged me, and I expressed a hope to be used more of God than ever. "And you will be used of God, my brother," he exclaimed. "God Himself will bless you! Toil on!" "May I venture to ask you to give me a word of special counsel in regard to my own work for God," I asked, "that I may pass it on to other Christian toilers in the great harvest field of souls?" He answered: "Seek entirely to depend on God for everything," he answered. "Put yourself and your work into His hands. When thinking of any new undertaking, ask, Is this agreeable to the mind of God? Is it for His glory? If it is not for His glory, it is not for your good, and you must have nothing to do with it. Mind that! Having settled that a certain course is for the glory of God, begin it in His name and continue in it to the end. Undertake it in prayer and faith, and never give up! "And do not regard iniquity in your heart. If you do, the Lord will not hear you. Keep that before you always. Then trust in God. Depend only on Him. Wait on Him. Believe on Him. Expect great things from Him. Faint not if the blessing tarries. And above all, rely only on the merits of our adorable Lord and Saviour, so that according to them and to nothing of your own, the prayers you offer and the work you do be accepted." And all the silent heaven of love." From another room Mr. Muller fetched a copy of his life, in which he inscribed my name. His absence afforded me an opportunity of looking around the apartment. The furniture was of the plainest description, useful and in harmony with the man of God who had been talking to me. It is a great principle with George Muller that it does not become the children of God to be ostentatious in style, appointment, dress, or manner of living. He believes that expensiveness and luxury are not seemly in those who are the professed disciples of the meek and lowly One who had not where to lay His head. On a desk lay an open Bible, of clear type, without notes or references. This, I thought, is the abode of the mightiest man, spiritually considered, of modern times—a man especially raised up to show to a cold, calculating, selfish age the realities of the things of God and to teach the Church how much she might gain if only she were wise enough to take hold of the Omnipotent Arm. I had been with this prince of prayer one whole hour, and only once had there come a knock at his door. It was opened by Mr. Muller, and there stood one of his orphans—one of the largest family on earth—a fair-haired girl. "My dear," said he, "I cannot attend to you just now. Wait awhile and I will see you." Thus was I privileged to remain uninterrupted with this man of faith, this prevailer with God, this traveler of ninety-one years along life's rough pilgrimage—a man who, like Moses, talks to God as a man talketh to his friend. To me it was as one of the hours of Heaven come down to earth. His prayer was short and simple. Going to his knees he said, "O Lord, bless this dear servant now before Thee more and more, more and more, more and more! And do Thou graciously guide his pen in what he may write in regard to this Thy work and our conversation today. I ask it through the merits of Thy dear Son, our Lord and Saviour Jesus Christ. Amen!" The Founder of the Ashley Down Orphanage, Bristol, England, was born in Prussia, September 17, 1805. In his young manhood he lived a godless life, but at the age of twenty-one he was suddenly converted to God at a prayer-meeting held in the house of a pious tradesman. Shortly afterwards, he came to England, bringing with him no letters of introduction, no money, no name, no recommendations, and only a very imperfect knowledge of the English language. What, then, did he bring? He brought God with him. Shortly after landing, he wrote in his journal: My whole life shall be one service for the living God. His principles were deeply rooted in the Holy Scriptures, and he adhered to them through the course of his long life. He never asked help from anyone and never hinted that help was needed. Solely in answer to believing prayer more than a million and a half sterling, seven million, five hundred thousand dollars, was sent to him for the building and maintenance of "God's Orphanage," for his missionary enterprises, and for the circulation of the Scriptures. In his homes ten thousand destitute orphans have been received, trained, educated, and sent out into the world. In his old age he traveled nearly two hundred thousand miles in forty-two countries, preaching the Gospel to three millions of hearers. Having thus served God in his day and generation, his spirit, like that of Moses, was kissed away by the mouth of Jehovah, when all alone in his room, on the early morning of March 10, 1898. His age was ninety-three. "He asked life of Thee, and Thou gavest it him, even length of days for ever and ever."